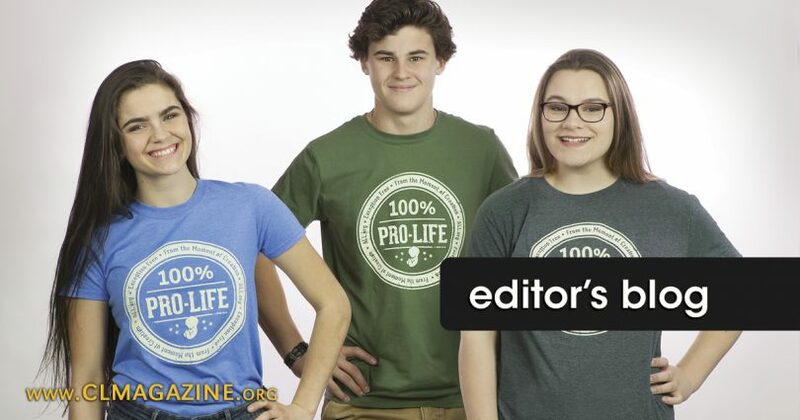 American Life League’s 2018 pro-life t-shirt was extremely popular at the March for Life expos this year. We ran out of all adult sizes and had to take orders to ship them when we got back to the office. The shirt continues to be highly popular. Naturally, the concept and design are both excellent, but I think the t-shirt is popular main for its message. Once understood, the 100% pro-life message resonated with so many people, and still does. The message is so simple and is at the core of what it means to stand up for all innocent human beings without exceptions. We have 100% respect for all innocent human beings, which means preborn babes, senior citizens, and people of all abilities based on intrinsic truth, natural law, and a desire to build and enjoy a culture of life. So many are tired of “pro-life” bills that include exceptions and other absurd compromises that tolerate the killing of some with the hope of eventually stopping all killing. So many have realized that violating solid principles in exchange for a pragmatic approach is both wrong in and of itself and doomed to failure. A culture of life and a culture of death are diametrically opposed. There can be no compromise; there can be no negotiation; there can be no exceptions. This is what it means to be 100% pro-life.